As you know, pedestrian safety is an issue that affects all of us. Whether it's a stroll around the corner, to a friend's house or work, or simply as exercise to clear the mind after a long day indoors - Americans love to walk. Walking is not just an exercise, it affects our health, it's good for the environment, it improves our quality of life. We are all pedestrians at some time of day. Yet, this simplest of life's pleasures sometimes comes with a terrible cost. Each year thousands of pedestrians are killed or injured. In fact, during the last decade, more than 63,000 pedestrians died and more than a million others were injured in pedestrian-vehicle crashes. The good news is that there are things we can do to put an end to this. The Federal Highway Administration (FHWA) is working to make a difference and make walking safer. 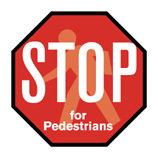 FHWA created the Pedestrian Safety Campaign Planner in collaboration with national and local pedestrian safety advocates to educate pedestrians and drivers about ways to improve pedestrian safety. The names of these advocates and the organizations they represent are listed on page 39. Raising awareness about these important issues isn't easy. In a world where we are bombarded everyday with information from emails, voicemails, cell phones, personal communication devices, websites with pop-up ads and telemarketing calls at dinner time, it's easy to overlook devices that are designed to keep us safe while walking; like crosswalks, pedestrian signals, and pedestrian warning signs. It may seem like a daunting task, but with this campaign, we can educate both pedestrians and drivers about what to look for, what to expect and how to proceed in an attempt to reduce pedestrian injuries and fatalities and achieve greater pedestrian safety. The Pedestrian Safety Campaign materials included in this kit are research-tested and designed for use by any organization to promote pedestrian safety. They are public domain materials. We hope that by making these materials available, we can help make travel safer for pedestrians everywhere. This document is disseminated under sponsorship of the Department of Transportation in the interest of information exchange. The United States Government assumes no liability for its contents or use thereof. This report does not constitute a standard, specification, or regulation. As pedestrians, sometimes we forget to look both ways when crossing the street, we ignore traffic signals at intersections, and sometimes our lives are so hectic that we do not pay attention to the traffic moving around us. The Pedestrian Safety Campaign Planner and Step-by-Step Guide are designed to help communities conduct their own multi-media public education and information campaign. A list of campaign materials is provided on page 9 and a matrix identifying the types of campaign materials is provided on page 100. To keep the campaign focused, it is important to develop your own goals and strategies. This Step-by- Step Guide contains recommendations. You can find a list of concepts for conducting your campaign on page 17. However, you may want to develop goals and strategies specific to your community's needs and local media opportunities. It is hoped that you will consider using these materials in your community through all media available to you - television, cinema, radio, electronic and print. 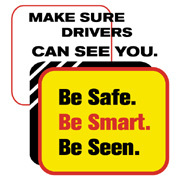 Motivate drivers to look for and stop for pedestrians. 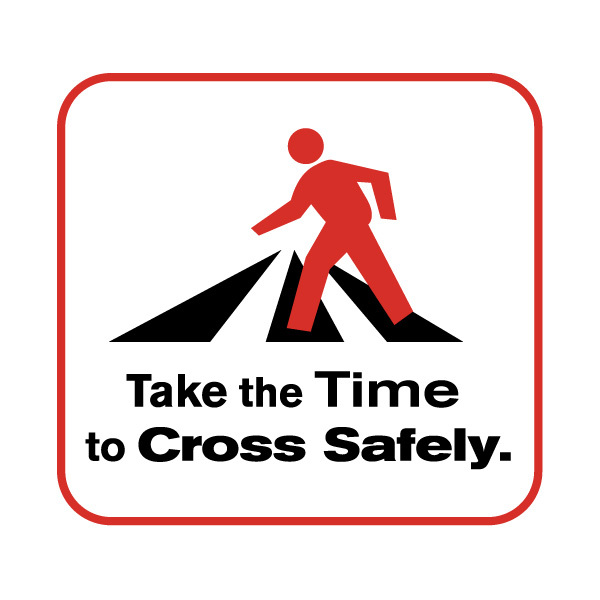 Motivate pedestrians to use crosswalks and designated crossing locations. Educate pedestrians about, and encourage the proper use of, pedestrian signals. Encourage pedestrians to make themselves more visible in the dark, by wearing reflective clothing or carrying a flashlight. A lack of understanding about pedestrian crossing signals? A failure of pedestrians to obey pedestrian traffic signals? 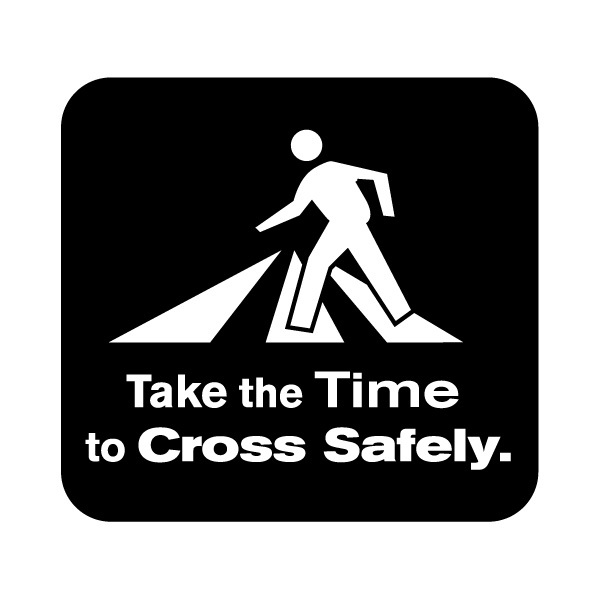 A failure of drivers to look for pedestrians in crosswalks and unmarked crossings? Pedestrians walking in dark conditions? Increasing awareness about pedestrian safety issues. 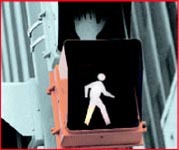 Increasing awareness about pedestrian traffic control devices (signs, signals, etc.). Motivating pedestrians to obey pedestrian traffic signals. 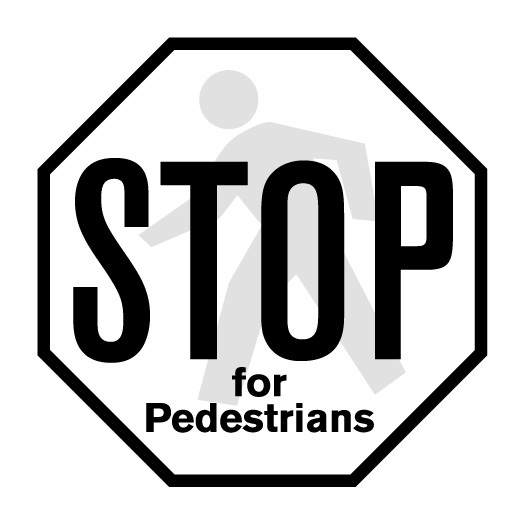 Encouraging drivers to pay attention and stop for pedestrians. To achieve your community's campaign goals, develop creative strategies for successful media placement. If you are not familiar with developing media strategies, find out if your state Department of Transportation (DOT) has a communications office, or ask a local public relations firm if they would be willing to provide some free advice in exchange for recognition in your campaign materials. Also, if you or someone you know has a friend in the media, see if they'd be willing to provide you with some pointers. Some basic strategies for your campaign:"
Form a local coalition of pedestrian safety advocates who have the time and are willing to make a significant contribution to the campaign. Your coalition might include key persons from law enforcement, education, engineering, health, elected officials and members of the media. Identify a media "champion," who will provide significant coverage of the campaign, preferably a local outlet with the largest audience base. Include the media champion in your coalition. Product Development and Printing (tailor the materials in the kit by adding your state or local logo, and print enough copies to send to all local media). Placements of the enclosed PSA materials in TV, radio and print media. News stories on local TV stations and radio stations. TV and radio interviews with members of the coalition and/or high-ranking local officials. Consider using the 6-event campaign (6-day, 6-week or 6-month) format as outlined in this planner on pages 17-19. To get the media interested in your campaign, you need to show them why this issue is so important. This information is often called a "hook" or "angle." There are some basic hooks on page 24 of this guide. Be sure to tailor the hooks to fit your community, using local information such as local pedestrian injury/fatality statistics, a list of dangerous intersections, or a list of intersections where new or additional pedestrian safety engineering countermeasures are planned or have recently been installed. 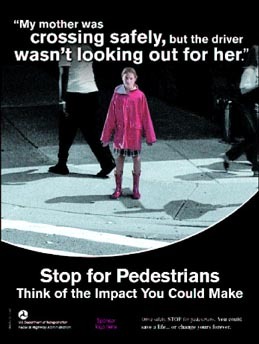 Stop and Look for Pedestrians. Think of the Impact You Could Make. Wear Reflective Materials. Be Safe. Be Smart. Be Seen. Don't Take Chances. Obey Pedestrian Traffic Signals. Take the Time to Cross Safely. It Could Save Your Life... or Change it Forever. See page 100 for a list of materials that indicate pedestrian/driver focus, page references and language. When initiating efforts to conduct a Pedestrian Safety Campaign, maximize resources and reach by securing a well-rounded group of subject matter experts, businesspeople, civic leaders and dedicated community volunteers. Enlisting the support of these allies could make the difference between a successful program and a mediocre one. Added credibility to the community, when there is a coordinated plan, a united front and a consistent message. Begin by forming a core group of three or more organizations. Remember, as few as two or three dedicated members can keep a coalition going. Discuss possible dates for first meeting. Set a date. Send out letters announcing meeting date, time and place. The letter should briefly inform about the purpose of the campaign and your community's goals. The first meeting is informational. Propose a name for the coalition. Have a representative from each participating organization sign up as a group liaison volunteer. This will be your contact person within a given group. Tell the coalition the campaign goals you have developed for your community and/or invite coalition members to further define and refine goals. The second meeting should solidify goals, and develop strategies, tactics, job assignments, timeline and next steps. Meeting schedules and frequencies will depend upon proposed projects. Public works or engineering officials. Refer to Table 1 on page 13 for a more comprehensive list of organizations and individuals that may support this cause. Before contacting particular individuals or groups, find out what their needs, interests and goals are. Match your needs to the needs, interests and goals of your potential coalition members. You will need to relate your campaign to their needs, interests and goals when you contact them. If you can show how helping this cause helps them, they will be more likely to join forces with you. What benefits they can reap by participating. What this particular person or organization could do to support the program. If you have gained a supporter, follow up with written thanks and next steps. If you have been turned down, it is still important to follow up with written thanks. You are creating the first impression of the program. You want the word-of-mouth generated within the community to be positive. The core group will keep everything going. The core group meets as often as necessary - once a week, three times a month - whatever is required. Communication is key. Use every means available. You might want to set up a group email and/or conference calls. Engineers, planners and pedestrian coordinators are important because they have insight into the safe design of roadways and pedestrian facilities. Members assigned to this task area serve a twofold purpose. First, they can serve as a voice to the community. They can share firsthand knowledge of the consequences of pedestrian crashes with local schools and neighborhoods. Some may even serve as appropriate media spokespersons, if properly trained in message development and other media techniques. Second, they often are associated with hospitals and other healthcare institutions that have strong media contacts already established. These coalition members can be one of your conduits to a strong voice in the community. In addition, they have a very good idea of the health benefits and hazards associated with walking, as well as access to hospital data on pedestrian crashes. Law enforcement coalition members can also serve as a voice to the community. After working with your local law enforcement organizations, identify appropriate spokespeople, and encourage them to make presentations at local schools, associations and town meetings regarding the Pedestrian Safety Campaign. In addition, where appropriate, law enforcement should be involved with actively enforcing the locality's pedestrian laws. They also have access to police crash reports and data on pedestrian crashes. Data needs to be collected, analyzed, evaluated and summarized prior to the official program kickoff. The data group is responsible for comparing and analyzing the national and local data to present a more compelling case for local action. For instance, if pedestrian crash statistics exceed the national norm, your coalition has a built-in message platform to convey to the community and the media. Members assigned to this task area could include a representative from the office of your Governor's Highway Safety Representative (GR), enforcement officials and safety engineering professionals. Crash data is usually available from the police department. If community support and corporate donations comprise a significant portion of your budget, fundraising is an essential task. Finding at least one or two professional fundraisers who will support the campaign and direct volunteer fundraisers is crucial to success. Local universities and charitable organizations are usually good sources to tap for experienced fundraisers. In order to secure placements of the PSAs, news stories and other materials, you will need individuals who are skilled at handling the media and generating media interest. These coalition members adapt the generic press materials provided in this kit so they have a local focus, contact the media to pursue press coverage, oversee production and placement of public service announcements (PSAs), manage production of all promotional items, and plan events (such as the program kickoff press conference and traffic safety fairs). Members assigned to this task area include local media representatives, volunteers from local advertising and public relations agencies and your organization's public affairs or media relations expert. A sample "pitch letter" to potential coalition participants is provided on page 16. Ask yourself what types of skills you need that your core group cannot provide. Then ask that core group if they know individuals with those talents or skills. You will be amazed at how quickly the gaps are filled. One group member may have found a particularly useful way to accomplish something that would benefit other task areas. Bringing groups of people together to brainstorm about possible ways of doing things (creating media attention, etc.) will ensure no resources are left untapped. The larger the number of people you have working with you, the more likely your message will get out to the community at large (as long as that number is reasonably sized - you don't want the coalition to become unwieldy). Ask current coalition members to recruit friends, family and business associates to support your cause. Word-of-mouth is one of the most powerful tools at your disposal, so make it work for you by encouraging coalition participants to talk up the pedestrian safety project effort. Numbers count, particularly if you institute a letter-writing program or similar tactic. 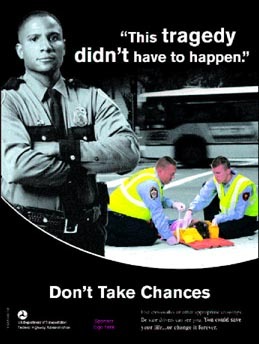 Did you know that according to Anytown police statistics, 340 pedestrian crashes are reported every year? And that last year alone, seven Anytown pedestrians were killed? Because we are concerned about the safety of our community's citizens, as well as the associated economic costs to Anytown, we are implementing the Anytown Pedestrian Safety Campaign , a public information and education program organized by Anytown's Mayor Carol Smith. The goal of the program is to increase the community's awareness of pedestrian safety by targeting both pedestrians and drivers. We seek to educate the community about devices like crosswalks and pedestrian traffic signals that help to keep pedestrians safe and healthy. 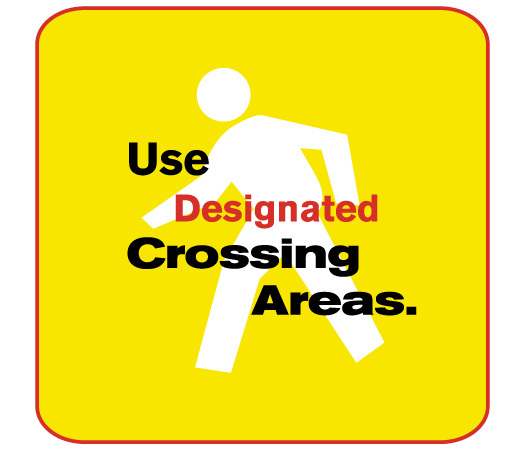 In addition, we hope to raise awareness among drivers and remind them to always look for pedestrians, especially at designated crossing locations. I hope you will consider being part of the Anytown Pedestrian Safety Campaign coalition and would appreciate a chance to further discuss this program with you. I will call you in the near future to set up a time that is convenient for you. This Pedestrian Safety Campaign is intended to be customized and therefore unique to each community, based upon local needs and resources. This Step-by-Step Guide is designed to guide each community in building a successful campaign, using the ideas and strategies provided. 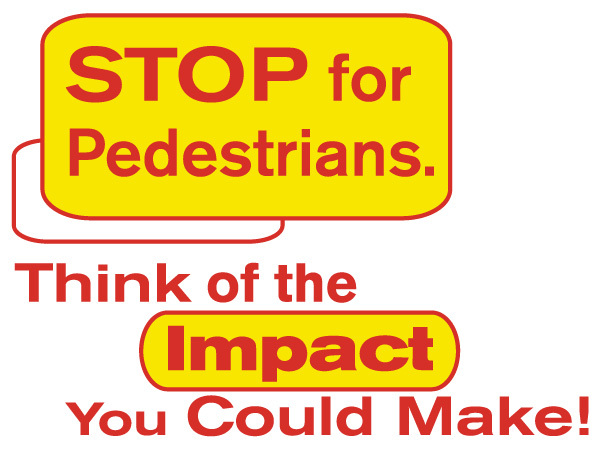 The Pedestrian Safety Campaign can be customized for your community in a number of ways. One way to organize your coalition's effort is to schedule the following six elements based on a 6-day/6-week/6-month timeline. The duration of your timeline should be selected based on your coalition's interests, membership, resources and goals. It does not have to be a 6-event campaign. Be sure to check community calendars to avoid major events that would prevent media from covering your event. Talk to media outlets before setting a date for your kickoff and other important events. The materials provided are for your adaptation and use in implementing your campaign. This planner includes six important areas of focus. Your coalition may choose to focus on these events or may choose to vary them according to the needs of your community. You are not committed to using these six ideas. You can implement any number of them. The materials are designed to work with the following themes. Event 2: Targeting the Pedestrian: Reflective Materials: What are They? Event 1: Targeting the Pedestrian: Traffic Signals & Crosswalks Program kick-off event in local town center with speaker. Speaker could be a victim of a pedestrian crash. May be related to recently installed/improved pedestrian facilities. Send out a program kick-off press release. Distribute campaign materials. Event 2: Targeting the Pedestrian: Reflective Materials: What are They? Scheduled speaker at City Hall explains why pedestrians need to be visible at night and how reflective materials can help. Send out a reflective materials/event press release. Distribute reflective items/brochures. Event 3: Targeting the Pedestrian: Child Pedestrian Safety School event distributing reflective stickers or pins, offering an opportunity for local law enforcement to speak to children about the importance of visibility and other safe pedestrian behaviors, such as crossing techniques and the meaning of the pedestrian signals. Send out a press release about child pedestrian issues. Work with teachers to include this topic in curriculum and prepare materials for parents to get involved. Event 4: Targeting the Pedestrian: Elderly Pedestrian Safety Event at local senior center offering an opportunity for local law enforcement to speak to seniors about special considerations for their safety when walking. Could also offer an opportunity for a local senior to address the public/press about the importance of driver cooperation and attention to senior pedestrians. Invite media by sending out a "vulnerable road users" and event press release. Event 5: Targeting the Driver: Look and Stop for Pedestrians Event coordinated with law enforcement to stop drivers who fail to stop for pedestrians in the crosswalk. Media invited to film the operation and speak with community officials about the operation and its impact on pedestrian safety. Event 6: Targeting the Driver: Unsignalized Crosswalks and Mid-Block Crossing Campaign closing event featuring a victim as speaker. Wraps up the campaign. Use a campaign-closing press release. Distribute campaign materials. Each campaign coordinator can use these ideas as they relate to an individual community's needs and resources. You may want to create a fast and hard-hitting schedule, or you may want to stretch activities through changing seasons. The campaign materials provided can be successful in many different formats. For a 6-day timeline, your activities will have to be quick, easily understood and rapid-fire. Each day is a different unit or focus. To be successful with this timeline, secure a media partner, or partners, first. The media partner(s) should commit to running a story or PSA every day of the campaign. The 6-day timeline could work well for school-related activities. The 6-day timeline could be any 6-day period you choose. Spread the campaign out and encourage local organizations to conduct their own activities with this timeline format. Each week is a different focus. Week one could include a pedestrian parade through town with the Mayor and other local officials, with events at schools, public transportation sites and local businesses the following weeks. The 6-week timeline could be any 6-week period you choose. Warmer weather increases outdoor activity. Warmer weather increases outdoor activity and message coincides with the end of the traditional school year. Daylight savings time begins and darkness falls earlier. Days continue to shorten. A 6-month timeline could be most effective for a coalition with extensive membership and resources. Each month is a different focus. There is more time between activities, offering the coalition ample opportunity to coordinate large events/projects. The 6-month timeline could be any 6-month period you choose. Complements the traditional school year calendar. More useful for a broad campaign that does not require school partnerships for distribution of message. 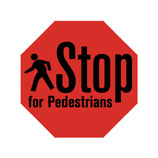 There are a variety of ways to obtain funding for the Pedestrian Safety Campaign. Following are some suggestions - however, we recommend that you contact your State Department of Transportation for more information on funding options. Under the current Federal transportation funding bill - the Transportation Equity Act for the 21st Century (TEA-21) - the Surface Transportation Program (STP) is a category of funds that is apportioned to each state. A pedestrian safety awareness campaign to improve compliance with traffic control devices (pedestrian signs, pedestrian signals, crosswalks, etc.) is eligible for STP funding and falls within the eligibility requirements of the STP Safety and Transportation Enhancements set-asides. TEA-21 requires that 10 percent of these STP funds each be set aside for infrastructure safety and for Transportation Enhancement activities. State highway or transportation agencies are charged with administering the Federal aid program and are the contact points for discussing STP funding requests. The Section 402 Highway Safety Program was established by the Highway Safety Act of 1966 and is codified within 23 U.S. Code 402. This Act directs that every state has an approved highway safety program designed to reduce traffic-related fatalities and injuries. State 402 Program funds are administered by the National Highway Traffic Safety Administration (NHTSA) through funding to the Governors' Highway Safety Representatives in each state. Salary for a program site coordinator. Subcontracts with public relations and/or media firms. Production of bumper stickers, buttons, and other promotional items. Travel expenses for meetings and presentations. Program-related telephone and fax expenses. Fundraising for your program takes effort and enthusiasm from you and your volunteers, but there are also many benefits of raising your budget through your own work. Aside from the financial gain, you also gain self-sufficiency and independence. It is also a way for you to enhance the strength of your organization and rally around a cause for which the community has already voiced support. Finally, good fundraising creates its own publicity and allows you to highlight your Pedestrian Safety Campaign with key audiences and local media. Make sure you have volunteers with fundraising experience or professional fundraisers as part of your community Pedestrian Safety Campaign coalition (see Organizing a Coalition for assistance). Create a fundraising committee or add these individuals to your special events committee and ask them to brainstorm ways to raise funds. Make it a topic of a committee meeting and review suggestions. Solicit companies by targeting business organizations that are involved in, or highly concerned with, highway safety - such as insurance companies, or businesses with a high number of employees that commute by car. Review the economic statistics with these groups to stress that the public's compliance with traffic controls will ultimately benefit them (insurance companies save money in reduced claims, large companies eliminate the productivity losses caused by absent employees, etc.). Some companies will benefit simply because their sponsorship of a program that is good for the community will earn them goodwill and media exposure they would not otherwise get. Practice talking about the program and asking for money. Most people find asking for money difficult, and usually a potential donor will not offer money on their own. Be prepared to meet with potential contributors at their convenience and make the most of every opportunity. Be ready for short-notice meetings by doing your homework prior to your first contact. Some foundations or organizations make what they call a matching grant, which will provide a set amount of money if you raise a specific amount in a given time period. If you decide on fundraising events, plan activities and events that are fun. It is important that you and your volunteers are having a good time and look forward to the event. Negative attitudes on the part of fundraisers may affect the effort put forth. Make sure you invite the media to your fundraising event. This is an ideal time to promote the cause of the fundraiser. Many foundations have funding for public education programs. Investigate foundations in your community. Many companies and organizations may be more willing to donate items and time rather than money, and sometimes this may be even more valuable. Whenever you can, approach companies for donations of this type. Printers and publishers are the most obvious sources to explore, but also look for creative communications methods that can be donated. Marketing, advertising, and research companies may help develop your phone survey list and actually do the calling for you. Public relations agencies often seek pro-bono clients to promote their services, and may offer to assist you in creating media lists, or writing and editing your press materials. Colleges and universities are potential resources to assist in pre- and post-program analysis. Research or marketing departments are often interested in "real life" projects for students as part of the class curriculum. Even grocery chains or snack food companies will sometimes donate food and drinks for a special event that benefits the community. Local sports celebrities often donate their time to promote events in their community. If you have doubts about which companies in your community to target, you may try sending letters requesting support to the "Top 100 Businesses," a listing which is published in many cities' newspapers or magazines. Your letters do not need to specify what type of support you are requesting, but you should follow up in a timely manner with a phone call to discuss options. Whenever appropriate, recognize donations of this type in your media materials and inform the organizations' community affairs representatives that they may receive media coverage if they work with you. In working with the media, use the materials that this campaign provides. Use these materials as examples of format for creating your own communications. 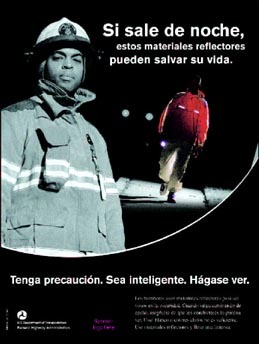 Encourage pedestrians to wear reflective materials by securing placements of the "Pedestrian/Night Visibility" TV PSA and appropriate print PSAs. Form a coalition of advocates who can support the campaign in a variety of ways, such as adding weight to the campaign with their credentials; helping out with media outreach, printing or other needed services; and bringing in sponsors to pay for a media buy. Lay the foundation for a successful PSA campaign by creating a media event that will garner significant media coverage. Boost media coverage of the media event by securing the participation of local officials and other prominent members of the community. Maximize PSA placements by saturating all appropriate local media contacts. Secure continuing media coverage by partnering with key media contacts (this may require some paid placements, otherwise known as a media buy). Augment media placements with promotional media placements, such as posters, bumper stickers and other "giveaways" at local events. Conduct a press conference with the highest-ranking local official you can secure, business leaders, community leaders, and either your regional DOT representative or other local safety representative. Create your own newsworthy event and invite local officials, business/community leaders, and safety representatives (see more on events on page 25). Conduct a "walking tour" of pedestrian safety engineering countermeasures (crosswalks, pedestrian signals, etc.). "Piggyback" on a national event (see more on hooks below). Secure a media champion who will advocate for the cause as often as possible. Distribute the PSAs and conduct aggressive phone call follow up (see more on media outreach on the next 10 pages). 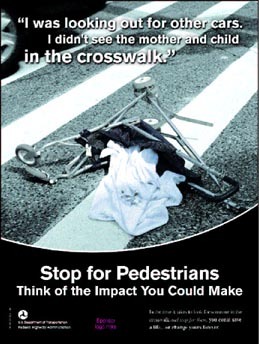 National or local Pedestrian Safety Week. Following a high-profile local pedestrian/car crash. When national, regional or local statistics are announced regarding the number of pedestrian injuries/fatalities (increase or decrease). When family members of a local pedestrian/car crash victim are willing to speak out and/or holidays that highlight long-term effects on victims' families (first day of school year without Mom, Father's Day without Dad, etc.). When school starts and children are walking to school. When local officials or the media are talking about high-incident locations. When new signals are installed. When new crosswalks are painted. When old crosswalks are repainted. After the holidays when people are resolving to exercise more. Early Spring when the weather starts to warm up and people are outside more. When daylight savings time begins and people are likely to be caught in the dark in dark-colored clothing. International Walk Your Child to School Day. A well-timed press conference can boost awareness about your campaign with the general public and with the media to which you want to send the PSAs. Select your kickoff date as early in the planning process as possible. The earlier you can book the speakers you want, the better chance you have of getting them. When picking a date, check your community calendar to ensure there are no other conflicting events and that the date does not fall on a holiday or weekend. Newspaper and TV stations maintain smaller crews during weekends, which means less staff to divide among news events. Press conferences are best held on Tuesdays, Wednesdays or Thursdays. By Friday, many reporters and editors are putting the weekend programming and editions together. Able to accommodate a stage, seats, tent and camera equipment with room to spare for interviews following the presentations. Near downtown (TV crews may not travel too far to attend). Able to provide electrical outlets for audiovisual equipment. Arrive early and ensure that all equipment is functional. safety advocate, or the head of your local coalition. Ideally, you should have no more than four to five speakers, with each saying something significant about the campaign from their own perspective. Each should speak for a short period, with the entire event (including press questions) taking no more than 30 minutes. High-ranking officials will draw media attention, so plan appropriate, secured areas for them. Be sure to provide speakers with brief talking points. Speakers should be available for one-on-one interviews after the press event. First, ensure you have visuals that will help you get on the evening news. People at a plain podium will make for dull television, so display as many campaign materials as possible, including the print PSAs, posters, and brochures. Localize the event as much as possible. Create simple, professional charts showing local pedestrian crash statistics and photographs to make your case. Second, recruit members of your coalition to be audience members. You want chairs filled as TV crews are filming. Be sure to have light refreshments available for your attendees. Third, you can also request the presence of local officials by sending them invitations four to six weeks before the event. Follow up with a phone call. Request that they demonstrate their support for pedestrian safety by attending. Send letters to local police departments requesting that officers attend and to local hospitals requesting that trauma doctors and/or nurses attend. Fourth, hire a photographer with news experience. Most photographers charge affordable hourly rates. This is a rare opportunity to photograph high-ranking officials supporting your cause and speaking on its behalf. Be sure to get not only candid shots, but posed shots with the coalition leader and officials present. These photos may be used with news releases later. Photograph in color; you can always convert to black and white. Three to five days prior to your press conference, hold a briefing session for all involved. Brief your speakers, ensuring the relevant speaking points are addressed. Provide talking points composed as a list of important and related bits of information. Review logistics such as seating, the order of the presentations and where media interviews will take place. This is a troubleshooting meeting. Don't end it until everyone is comfortable with his or her role and what's expected. Two days prior to your press conference, distribute media alerts to local newspapers, radio and TV stations and magazines. When the media arrives, be sure you have a coalition member greeting them, signing them in and distributing media kits. Be sure all names are legible; you'll need them later for follow-up. If you decide to distribute copies of the TV, radio and print PSAs at the event, place a stack on the media sign-in table and make sure their availability is mentioned. You should have an area roped off at the rear of the audience for media cameras. Reporters should have reserved seats near the front so they can easily ask questions at the appropriate time. Before the event, you should hire a local TV and radio monitoring service. This service will tape all appropriate channels to give you a record of coverage. Press clipping bureaus follow print placements and can track your print placements for a fee. Such businesses can be found in your local yellow pages under "clipping and monitoring services," "media monitoring," or "press clipping service." If your budget is tight, volunteers can accomplish these tasks, but be sure you have a record of all media coverage. 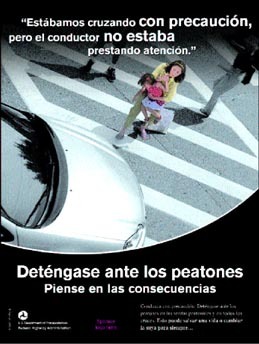 The television PSAs provided with the Pedestrian Safety Campaign Planner are "encoded." This special information identifies your PSA as it is run. Some stations offer placement reports, but the encoding also allows for a hired monitoring service (found in telephone directories under "media monitoring") to track the number of placements and the times at which they were run. This is valuable information for you to use when you evaluate your campaign. If key media do not attend, follow up with a phone call and offer an interview, photos, video of the event, etc. Send thank-you letters to media and officials that did attend. Be sure to recognize the efforts of your coalition members. Even with letters of support and verbal agreements from law enforcement agencies, it is important for you to keep law enforcement involved with, and excited about, the campaign. Make frequent visits to police departments to keep the program in the spotlight. Gifts of bumper stickers, key chains, buttons, and other promotional items also help the cause. Keep in contact with the media after your program kickoff press conference; you still have many chances to get in the news. Contact TV and radio news and talk show producers, offering interviews with the program spokespeople. Keep an eye on the news; some events such as a major local traffic accident or newly released crash statistics will trigger or renew a news outlet's interest in a subject. Think of new angles to offer the media and pitch these to them in person or over the phone. For example, does the public really know what constitutes reflective materials? Do they know exactly what each pedestrian traffic signal means? Or the economic costs incurred by local pedestrian-car crashes? Pedestrian Safety Fair. Combine your safety message with others by holding a communitywide Pedestrian Safety Fair. Set up booths to promote the various safety messages and distribute information. An event of this type can be held in a town square, a mall parking lot or inside the mall lobby, a school parking lot, or a local park. Solicit community donations of tables, chairs, refreshments, balloons and other carnival supplies. Linking this event with a safety week or month can add longevity to the event and help obtain media coverage. School Visits. It's never too early to learn about traffic safety. 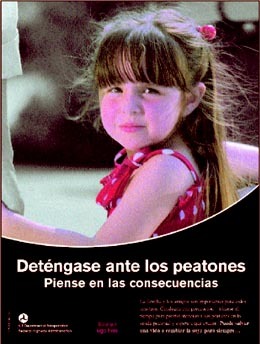 Past transportation safety programs have benefited from educating children to remind their parents to buckle up and look both ways before crossing the street. Presentations at local schools that teach children about reflective materials and what the pedestrian traffic signals mean are best given by law enforcement representatives in uniform. Check with your local law enforcement agencies to see if programs such as this already exist, and if so, work a pedestrian safety presentation into the schedule. If this is not something in which your community is already participating, obtain support of the police force and work with them to contact schools. Bumper stickers and buttons are excellent handouts for these presentations, as the children will bring them home to their parents. Pencils are also good giveaways for children. Encourage the involvement of the teachers, who may be able to tie your visit into his/her lesson plans and activities. Before contacting media or fielding media calls, be sure to establish a single spokesperson to handle most general media requests (law enforcement and medical personnel can handle specific questions in their respective areas). It is crucial that the campaign is presented in a consistent manner to the media, so it helps to limit the number of spokespeople who will assist you in this aim. Your spokesperson should have some media relations experience. This person also should review any and all materials before they are distributed to ensure that the campaign messages are clear and consistent. Confirm that the person you choose is willing to be easily accessible to the media. It could mean the difference between great coverage or none at all. After you've decided which media outlets to target, you should develop a specific list consisting of contact names, addresses, phone numbers, fax numbers and e-mail addresses of all the publications, stations and other outlets you want to receive your media materials. Many media directories exist to provide you with such information. Within this list, you'll want to highlight anyone who recently has written an article, or produced a TV and/or radio spot on traffic safety, or requested information for a possible story. These are "hot" prospects and should be targeted first. Another way to determine the individuals with whom you should establish relationships is to monitor the media for a month or two. Read newspaper columns, watch the local talk show hosts and figure out which local station is apt to cover programs of this nature. It is always a good idea to double-check the names listed in any media directory, simply because editors and reporters frequently change jobs and addresses. Request that they place the public service announcements (PSAs) provided. There are certain courtesies, such as being conscious of deadlines and returning calls promptly, that will enhance your relationship with all media representatives. However, different journalists (even those within the same medium) may want to receive information in different ways. Some may want a fax, while others prefer an e-mail or phone call with information. It is important that you familiarize yourself with their basic preferences. It's as simple as asking. Note: Many media prefer to receive information via e-mail, but do not like attachments which can take a long time to download. Whenever possible, cut and paste your press release into the body of the e-mail. Your first contact with a member of the media will usually be when sending a press release. Send press releases to big and small newspapers, cable and commercial television and radio stations. Either insert your local information into the press release template or write a cover letter explaining the involvement of you and/or other local people in the subject. Understand that reporters are usually working on a deadline. Call back right away. When a reporter calls you, always find out what kind of deadline he or she is facing. Decide in advance a few concise points you want to make if interviewed. Include a local contact name and number in your press release and/or letter. Respect the media's deadlines by responding promptly to all calls. Use personal experience to answer questions. Offer the reporter fact sheets and other supporting information. Remember that you are not required to be an expert about everything. 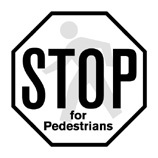 Refer reporters to your state pedestrian coordinator or state DOT for more information. You should plan on pitching story ideas to local television stations (particularly newsworthy events such as the kickoff event and enforcement days). There are two different avenues you can pursue at radio and television stations-news departments and talk shows. News departments are interested in timely stories, enforcement issues, statistics or a profile of the program. If inviting journalists to special events for coverage, contact or send a media advisory to the news assignment or planning editors at radio and TV news departments. A media advisory is a simple one-page news release in bullet-point format. Media advisories are generally faxed one day prior to the event so stations put the event on their scheduling books. Follow up with phone calls the morning of the event. Talk shows are put together by producers who are looking for interesting, credible guests to appear, live or taped, to discuss an event or issue. Send a one-page news release and/or letter to the producer of the show (see sample on pages 74-75), and follow up with a phone call. Offer the producer several guests who can speak authoritatively (police chief, program coordinator, medical community spokesperson) about the Pedestrian Safety Campaign. There is no need to wait until after your kickoff to begin media interviews - starting them a few days before kickoff will help you publicize the event. In addition to generating story interest, you will want to provide stations with PSAs. A meeting with a station's public affairs or PSA director will be your best bet in obtaining placement of your PSAs. During this meeting, it is important to come prepared with facts, figures and dates regarding the program to establish your credibility early. Use your coalition to write letters encouraging the director to run your PSAs. 1) A reporter and camera at your kickoff press conference and other special events. 2) Articles written on the program and inclusion of special events in the newspaper's community calendar of events. 3) Placement of print PSAs. Send media advisories, for events such as your program kickoff, to the City Editor one week prior to your event. You should plan to follow up with a phone call to determine interest. Call early in the week and early in the morning the day of the event as a general rule (obviously, some reporters will have other preferences - respect those). Check with the publication to determine its editorial deadlines. Morning newspapers generally have a 2:00 to 4:00 p.m. deadline. Your objectives when dealing with local magazines will be similar to those with newspapers, with the primary difference being deadlines. Editorial deadlines for many monthly magazines are usually two to three months in advance of the publication date. When creating your media target list and timeline, be sure you recognize the early deadlines of this medium. Most magazines are feature-oriented. Researching and writing these more in-depth stories requires a longer period of time than the stories written by daily newspaper reporters. Sending a letter to a magazine reporter, and following up with a brief phone call, may be the most effective way of reaching him or her. These stories will generally be less timely, but more detailed, than those done by daily newspapers. They are a big help when media attention starts to lag and help you keep the momentum going. The best way to arrange for a spokesperson appearance on a local cable talk show is to send a letter describing the situation and program to the producer of the show. Follow up with a phone call to ascertain interest. Send your letter about one month in advance of your desired coverage date and be sure to include the visual or video possibilities in your concept (footage of local officers enforcing the law, etc.). In addition, cable programming may have the best PSA placement opportunities. Contact the individual stations as you would the network TV stations. The Internet is a great way to get your message to the general public. When forming your coalition, a website designer and online writer would be immensely helpful in this area. Your site could include statistics, affiliate organizations and efforts, contact names for presentations and links to other coalitions, as well as links to a downloadable version of the campaign's PSA materials. Be sure to print your website address on any marketing materials and provide it to reporters. Another option is to piggyback on an existing city, hospital or law enforcement website. Most sites have contact names and numbers for more information. Ask for the reporter's name and the media organization for which he or she is reporting. However, it's best not to play favorites when deciding whether or not to grant an interview to a specific reporter. It may seem like a good idea in the short run, but in the long run it will damage your relationship with reporters and may come back to haunt you. When a reporter calls requesting an interview, you have a right to ask the subject of the interview and some sample questions. If you need time to collect your thoughts and the reporter's deadline allows, offer to call back later at a specific time - and follow through. Don't let yourself be ambushed by the media. If a reporter shows up in your office or calls at a time when you are unprepared, reschedule the interview for a time when you feel comfortable. Think of two to three main points you would like to make about the campaign. Gather facts, figures and anecdotes to support your points. Anticipate questions the reporter might ask and have responses ready. Have printed materials to support your information whenever possible, in order to help the reporter minimize errors. If time allows, offer to fax or mail the reporter printed information in advance of the interview. Be aware that reporters' schedules are determined by the breaking news of the day. Do not be offended if an interview gets canceled or rescheduled because a more urgent story arises. If you are being interviewed by phone, the reporter may be required by law to tell you when you are being recorded. If you're not certain, you should ask. Begin at a basic level. Avoid academic or technical jargon; explain special terms if you must use them. There are five C's to success: Speak with conviction in a conversational manner, while retaining your composure. Be confident. Remember that you are the expert. Be colorful - tell stories and anecdotes that illustrate your point. Give examples. Stick to your main points and do not allow yourself to get drawn too far off on tangents. Most people make the mistake of talking too much. Repeat your points if necessary to get back on track. Don't overestimate a reporter's knowledge of your subject. When a reporter bases a question on information you believe is incorrect, do not hesitate to set the record straight. Offer background information where necessary. If you do not understand a question, ask for clarification rather than talking around it. If you do not have an answer, say so. Tell the reporter where to find the information, if possible. Avoid saying things "off the record." Reporters may or may not honor this, and it annoys them. If you don't want to hear it repeated in the media, do not say it. Be honest. Don't try to conceal negative information; rather, let your interviewer know what you are doing to solve a problem. For television interviews, plan to wear solid-color clothing, but avoid solid white. Stripes, plaids and other designs can cause problems with color TV pictures. Avoid large, jangling or reflective jewelry. Choose a location where your can screen out extraneous noises. Hold your calls and turn off your computer, if possible. Avoid rooms with loud background hums from air conditioning or heating units. Find out in advance whether the interview is edited or "live." If you agree to a live interview, be sure you are comfortable thinking on your feet and responding off the cuff. In a TV interview, look at the reporter - not at the camera. The only exception is in a satellite interview, when the reporter or anchor may not be on location. If you're uncertain where to look, ask. Stay stationary in front of radio or TV microphones and avoid sitting in a chair that rocks or spins. Wandering around or rocking your chair can cause the recorded volume to rise and fall. Be aware of and avoid nervous habits, such as pen tapping, that can interfere with the interview. Ask the reporter to identify you with your organization and title. In most instances, you will not have the opportunity to check over the reporter's story before it appears. However, you can ask questions at the end of an interview to test for comprehension. For example, you might inquire, "What do you think is the main story angle here?" You may want to ask when a story will appear. The reporter may not have an answer, but may provide the date when it is available. After reflecting on an interview, if you feel that you misspoke or gave incorrect information, call the reporter as soon as possible and let him or her know. Similarly, you can call with additional information if you forgot to make an important point. If you are unhappy with a story, share your concerns with the reporter first. Contacting his or her editor is a last resort. For radio and TV stories, obtain a tape of the final broadcast if possible and critique your own performance, looking for ways you might improve in the future. If you have a clipping or tape, please share a copy with the FHWA Safety Office and provide your contact information. In order to get media placement, most public relations people make "pitches." We throw the story to journalists. Journalists hate to be bombarded with pitches, especially those pitches that are not relevant to their beat or specialty. b) the journalist is still even on that beat, since reporters change jobs and switch beats a lot. Direct, fast pitches: Can be made when you know exactly who to send your story to, and you know that the story clearly and directly relates to their beat. Slow pitches: Are made by tailoring your pitches for journalists who may have the ability to cover your story from an unusual angle that relates to their beat. Wild Pitches: Are pitching everyone in sight, from the managing editor down to the lowliest cub reporter. Journalists hate this, but there's a reason PR people do it: it sometimes works and it's not that much more expensive than the other two approaches. The reason it sometimes works is that by spreading the story to the widest audience, you may find a reporter willing to do the story who otherwise might have slipped through the cracks. The most effective way to use these pitches is to combine these styles to address a range of media that fits your target audience. Phone calls are a very effective way to boost your placement results. Journalists are inundated with information. By calling to explain your release and/or activities, you can make important connections with journalists that may result in coverage that you would not have earned by other means. When you place a media phone call, you are offering an opportunity for information gathering. The journalist can immediately obtain information without the work of doing additional research. Most of us can identify with looking for the most efficient route to take when completing our work. By helping make the task easier for the journalist, you can raise the likelihood that your story will be placed. Do you know what it means when the "Don't Walk" (or "hand") sign flashes? What does a marked crosswalk mean? 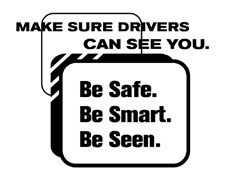 What can you do to make yourself visible to drivers in the dark? Do you know what factors make you more at-risk for being hit as a pedestrian? Do you normally cross at a designated crossing location? If not why? Do you remember any of the campaign messages? Did the campaign change/effect your behavior? Dollar value of "earned media"
There are a number of ways to evaluate this campaign. If you have funding or a willing sponsor, you could conduct surveys with the general public to test recognition and retention of the campaign themes and messages. However, if this is not an option, you can still evaluate your campaign's success by keeping track of the number of earned media placements and the dollar value associated with each (what it would have cost if the media placement had been purchased). If you can include a website or hotline number in your campaign, you can also quantify website hits and calls. One easy way to track placement of your materials and/or information that is distributed by the media is to supply each of your contacts with a fax-back form and ask that they return it to you completed via fax. This form quickly and easily informs you about how your efforts have resulted in placement. Please see the example form for TV PSAs on the next page. Feel free to use it as a template for your own fax-back forms. Reflective giveaways for community events, fairs, and malls - including arm bands, hats, Velcro/tape, gloves, shoe laces, etc. Images have been included on the Campaign Materials CDs that can be used to personalize promotional materials. See pages 71 and 72. For a complete list of campaign materials, please see the matrix on page 100. 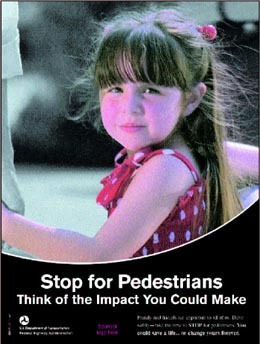 These PSAs can be found on both the beta tape and Data CD2 in the Pedestrian Safety Campaign Planner materials. Highlights a crucial concern for pedestrian safety: Drivers making left or right turns at intersections may not remember to look for pedestrians crossing. Uses film footage, voiceover and animated text to explain the pedestrian crossing signals. 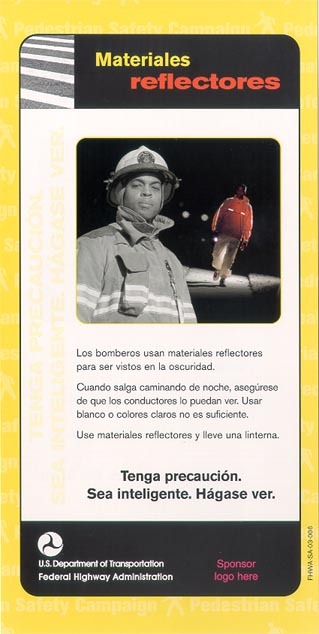 Shows a firefighter at work and walking in casual clothing at night, making use of reflective materials and emphasizing the importance of being visible when walking in the dark. Sounds of cars zooming by and other road noise. Then a young man's voice. He sounds sincere. "I'm a good driver. I look for cars. I pay attention." Sound of tires screeching, a young girl's scream, and shattering windshield. Then silence. Music becomes more somber. The driver is clearly emotional as he says: "I should have seen the little girl in the crosswalk." Narrator: "Please, look for pedestrians. Stop for them. Think of the impact you can make. A message from the Federal Highway Administration." Sounds of traffic zooming by. Above the noise, a young girl's voice. She is clearly upset. "Why was that driver in such a hurry? He was looking for other cars as he turned the corner. He wasn't looking for my mom in the crosswalk." Sound of tires screeching, a scream, and shattering windshield. Then silence. Music becomes more somber. Full of anguish, the girl continues, "I really miss her. . ."
Sounds of traffic zooming by. Above the noise, a young girl's voice. She is clearly upset. "Why was that driver in such a hurry? He saw the car in the other lane stop and he decided to go around it. He wasn't looking for my mom in the crosswalk." Sound of tires screeching, a scream, and shattering windshield. Then silence. Music becomes more somber. "I really miss her. . ."
Narrator: "Please, look for pedestrians. When a car stops in front of you, slow down and be prepared to stop. Someone may be crossing the street. Think of the impact you can make. A message from the Federal Highway Administration." Sounds of traffic zooming by then a young male voice. "We were just driving to school. Yeah, the music was loud and we were all talking. I thought I had everything under control." Sound of tires screeching, a scream, and shattering windshield. The young male continues, clearly emotional. "Until I hit that kid in the crosswalk." A young mom's voice, starts out sweet and turns very emotional. "In an instant, my son could make anyone smile. In an instant, he was gone. The driver was looking for other cars, but he didn't watch out for my son crossing the street. 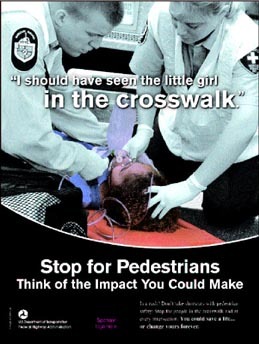 Imagine, in the time it takes to stop for someone in the crosswalk, you could save a life... or change yours forever." Narrator: "A message from the Federal Highway Administration." Sounds of several cars rushing by, then a young woman's voice. "I walk and you drive. So let's make a deal. I'll watch for you - and cross the street safely. You watch for me - and stop. Think of the impact we can make." There are many ways to use and place print PSAs. A variety of schools, businesses, communities, associations and religious groups publish newsletters and are willing to run PSAs. Most major magazines and newspapers offer PSA placement to some extent. Many times they will keep them on hand to fill advertisement space when an advertiser cancels an ad at the last minute. 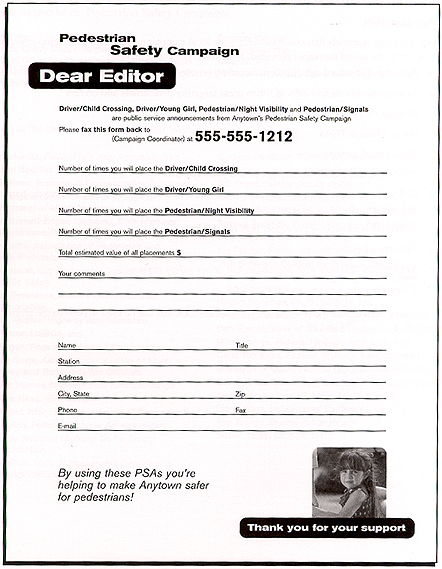 Companies and organizations sometimes donate ad space in their newsletters, brochures, or other print materials that may be filled with one of the print PSAs. Creative possibilities for PSA placement include bus signs, paycheck stuffers for local businesses, billboards, store flyers, insurance company bill stuffers, and palm cards for law enforcement and crossing guards. Call your nearby publications and ask whether they place PSAs, and if so, how they would like for you to deliver them. In most cases, you will provide electronic files. You will need to ask which file format they prefer, and then provide those files on a CD. The CDs in this kit contain QuarkXPress files, the file type most often preferred by print publications. Some may prefer to print the PSAs in black and white as opposed to full-color. If black and white is required, have a graphic designer convert the full color PSA files to black and white files before delivery to the publications. You may have graphic designer or printing firm add your organization or coalition logo to the PSAs prior to delivery to the publications. The text "sponsor logo here" should be removed prior to delivery. File is located on Data CD1 in the folder FHWA PRINT PSAs/DRIVER PSAs on page 2 of the Quark document DRIVER_PRINT_PSAs. File is located on Data CD1 in the folder FHWA PRINT PSAs/DRIVER PSAs on page 3 of the Quark document DRIVER_PRINT_PSAs. File is located on Data CD1 in the folder FHWA PRINT PSAs/DRIVER PSAs on page 4 of the Quark document DRIVER_PRINT_PSAs. File is located on Data CD1 in the folder FHWA PRINT PSAs/DRIVER PSAs on page 5 of the Quark document DRIVER_PRINT_PSAs. File is located on Data CD1 in the folder FHWA PRINT PSAs/DRIVER PSAs on page 6 of the Quark document DRIVER_PRINT_PSAs. File is located on Data CD1 in the folder FHWA PRINT PSAs/DRIVER PSAs on page 7 of the Quark document DRIVER_PRINT_PSAs. File is located on Data CD1 in the folder FHWA PRINT PSAs/DRIVER PSAs on page 8 of the Quark document DRIVER_PRINT_PSAs. File is located on Data CD1 in the folder FHWA PRINT PSAs/DRIVER PSAs on page 9 of the Quark document DRIVER_PRINT_PSAs. File is located on Data CD1 in the folder FHWA PRINT PSAs/PEDESTRIAN PSAs on page 2 of the Quark document PEDESTRIAN_PRINT_PSAs. File is located on Data CD1 in the folder FHWA PRINT PSAs/PEDESTRIAN PSAs on page 3 of the Quark document PEDESTRIAN_PRINT_PSAs. File is located on Data CD1 in the folder FHWA PRINT PSAs/PEDESTRIAN PSAs on page 4 of the Quark document PEDESTRIAN_PRINT_PSAs. File is located on Data CD1 in the folder FHWA PRINT PSAs/PEDESTRIAN PSAs on page 5 of the Quark document PEDESTRIAN_PRINT_PSAs. File is located on Data CD1 in the folder FHWA PRINT PSAs/PEDESTRIAN PSAs on page 6 of the Quark document PEDESTRIAN_PRINT_PSAs. File is located on Data CD1 in the folder FHWA PRINT PSAs/PEDESTRIAN PSAs on page 7 of the Quark document PEDESTRIAN_PRINT_PSAs. File is located on Data CD1 in the folder FHWA PRINT PSAs/PEDESTRIAN PSAs on page 8 of the Quark document PEDESTRIAN_PRINT_PSAs. The local movie theater can be a terrific way to get the message out to a captive audience. In this kit, we have included electronic versions of eight cinema slides on Data CD1. Hard copies of the slides are not provided because most theaters receive their slides from distributors with very specific formatting requirements. The distributors will need the electronic versions of the slides to duplicate them for use in theaters. In most cases you will have to find a sponsor to fund this method of communication. Cinema advertising is so profitable for the cinema industry that free placements are rarely provided. Some distributors have PSA rates that are less costly than commercial advertisements, but are still not free. Make use of the fundraising members of your coalition. They may be able to negotiate sponsorship. To find out how your local theatres manage their slides, call during business hours and ask to speak to the manager. The files for all 8 Cinema Slides are located on Data CD1 in the folder FHWA CINEMA SLIDES on pages 2-9 of the Quark document FHWA CINEMA SLIDES-RGB. Posters make great giveaways at events and can be distributed to department of motor vehicle offices, schools, religious organizations, health care offices and/or businesses. In this kit, we have included electronic files for five posters. Each poster has been designed in color, but they may also be duplicated in black and white. If you would like to duplicate the posters in black and white, have a graphic designer convert the full color files into black and white files before sending them out for duplication. There are three small posters (11" x 17") and two large posters (24" x 36") that can be duplicated, offering you a choice to make based on your intended use. If you're working with large spaces like blank walls, use the larger format. If you're placing them in a cluttered area, you will have to decide which size is best. While the large format is attention-getting, the smaller posters take up less room and may be more likely to stay up longer. When you place a large poster in an area that many people use to advertise, your poster may then be covered by others or removed. Most organizations/venues prefer that you ask for permission to put up posters before you post them. They may also have requirements about the materials you may use to adhere/attach them to surfaces. You may have graphic designer or printing firm add your organization or coalition logo to the posters prior to duplication. The text "sponsor logo here" should be removed prior to duplication. File is located on Data CD1 in the folder FHWA POSTERS/FHWA 11x17 POSTERS on page 2 of the Quark document GIRL_LOOKING_BACK_11x17. File is located on Data CD1 in the folder FHWA POSTERS/FHWA 11x17 POSTERS on page 2 of the Quark document AERIAL_MOM/GIRL_11x17. File is located on Data CD1 in the folder FHWA POSTERS/FHWA 24 x 36 POSTERS on page 2 of the Quark document TRAFFIC_SIGNALS_24x36. File is located on Data CD1 in the folder FHWA POSTERS/FHWA 24 x 36 POSTERS on page 2 of the Quark document REFLECTIVE_FIREMAN_24x36. The brochures provided with the campaign materials focus on pedestrian topics: reflective materials and pedestrian traffic signals. Research showed that the target audience wants brochures that are brief and concise. We have provided them in both English and Spanish for your adaptation and use. You can distribute them however you choose-direct mail, at fairs, shows or bazaars, in schools or office buildings, at theaters, performances, restaurants or bars. In many locations you will need to ask for permission to distribute literature. File is located on Data CD1 in the folder FHWA BROCHURES on pages 2-3 of the Quark document BROCHURE-REFLECTIVE. File is located on Data CD1 in the folder FHWA BROCHURES on pages 2-3 of the Quark document BROCHURE-SIGNALS. 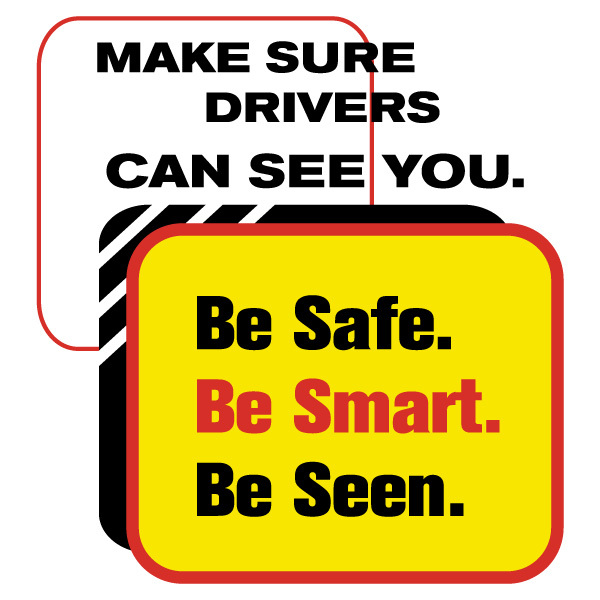 You can enhance your campaign by producing promotional materials that communicate the pedestrian safety messages in a variety of ways. Artwork for your duplication and use in producing a variety of promotional materials is included on the campaign materials CDs. Obtain quotes from at least three companies before picking a vendor to produce these items. Also keep in mind that ordering a larger quantity will usually lower the "per unit" price. Be sure to inquire about these quantity price breaks. 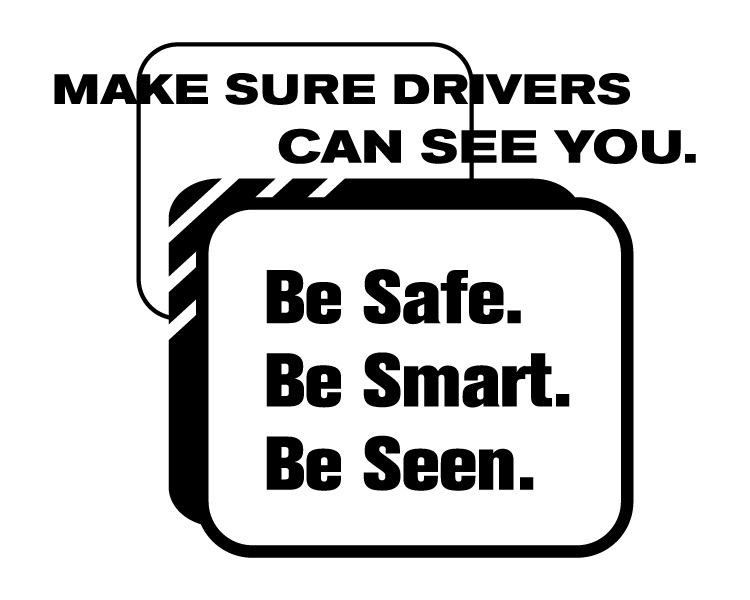 All 14 images on this page are located on Data CD1 in the folder FHWA PROMO ITEM IMAGES in the Illustrator file PROMO_SLOGANS_PG1.eps. Individual JPGs of each image can also be found in the same folder on Data CD1 within the folder JPGS_PROMO_SLOGANS. The individual JPG name is listed below each image on this page. All 12 images on this page are located on Data CD1 in the folder FHWA PROMO ITEM IMAGES in the Illustrator file PROMO_SLOGANS_PG2.eps. Individual JPGs of each image can also be found in the same folder on Data CD1 within the folder JPGS_PROMO_SLOGANS. The individual JPG name is listed below each image on this page. This kit includes everything you need to duplicate the Pedestrian Safety Campaign materials. * You will probably need several vendors to reproduce the various components. Carry this Step-by-Step Guide with you to discuss duplication options with potential vendors (found in telephone directories under "Communication and Media" or "Video" or "Production"). For the print pieces (PSAs, posters and brochures), a graphic designer or printing firm can help you add your coalition or supporting organizations' logo prior to duplication. They can also help if you need any of the files converted to black and white. For the television PSAs, you will need the help of a video editing studio. We do not recommend that you make any changes to the radio PSAs as the voiceover and music are "mixed." However, you can make duplicate copies. Please see below. On many items, additional language can be added that is specific to the needs of your campaign, for example, a statistic such as: "Last year in Anytown, 7 pedestrians were killed. We need everyone's help to keep our pedestrians safe." The print elements of this campaign can be duplicated in either black and white or full color. Directions for printing the PSAs, posters and brochures, along with instructions for customizing each piece with your coalition or supporting organizations' logo, are located on CD1, page one of the Quark document for that electronic file. The television PSAs included in this kit are on a broadcast-quality beta tape, which you can take to most television stations for airing. If you need to make copies, please request that the "Closed Captioning" and "Sigma Encoding" from the master be transferred to the copies. If the video production facility does not understand these technical terms, you may want to find a different facility. For information about TV PSA monitoring services, please see page 27. Electronic versions are available on CD2. To make copies of the radio PSAs, you may take the enclosed audio CD to a CD duplication facility (found in telephone directories under "CD Duplication"), or ask a local radio station if they can make copies for you. If you have a CD burner, you can copy the CD using your own computer. However, do not compress the files, copy them as is. Instructions for customizing the cinema slides with your coalition or supporting organizations' logo and saving your new files for cinema distribution are located on CD1, page one of the Quark document FHWA CINEMA SLIDES-RGB. * Never send out your only copy of the enclosed CDs. Make duplicate CDs for any vendor involved in reproduction/duplication. If you lose your CDs, contact Tamara Redmon. See contact information on page 1. If you have a media professional, public relations specialist or good writer in your coalition, you may want to develop your own news releases and articles for distribution to print and electronic media. A sample news release and news article are included in this planner and additional articles and releases are included on the enclosed Data CD2. You should use these articles and press releases as inspiration, and a formatting template, for your own documents. There are a variety of venues for your original news articles. Some newspapers do accept pre-written articles-especially if they are submitted by a prominent member of the community. Consider asking a high-ranking public official to "byline" your article for the local general newspaper or a well-known business leader to "byline" an article for the local business journal. Newsletters-both hard copy and electronic (email and web versions)-are also terrific vehicle for your news article. Look for organizations with a safety, health or education-related focus, such as the local hospital, parent-teacher organization, or apartment/townhouse/condominium community organization. Corporations with a commitment to the community might run an article in the company newsletter. And do not forget small clubs and organizations like the local Boy Scouts, Rotary Club or fitness center. Often, small organizations with newsletters are looking for content. Anytown, State*-(Coalition/Campaign Coordinator's organization name), public officials, local law enforcement and the general public are coming together to raise awareness about pedestrian safety. On (kick off event date here), Mayor Jane Smith and other officials will host a press conference at (time of day here) at (noteworthy intersection or City Hall address here). During the event, Mayor Smith will officially declare (campaign dates here) Anytown Pedestrian Safety Day/Week/Year. Sponsored by (Coalition/Campaign Coordinator's organization name), Anytown Pedestrian Safety Day/Week/Year is a comprehensive campaign to promote pedestrian safety and educate the public about important pedestrian facilities designed to protect both drivers and pedestrians. These devices include crosswalks, pedestrian traffic signals, and pedestrian warning signs. Campaign materials will be unveiled at the press event, including television, radio and print public service announcements (PSAs), school posters, and more. 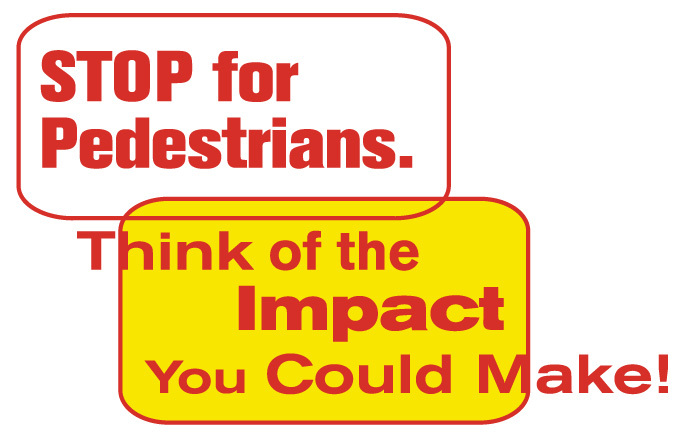 The campaign targets both drivers and pedestrians. According to (name of official), "On a national basis, over 5,000 pedestrians are killed, and 85,000 pedestrians are injured in roadway accidents every year, resulting in $20 billion societal costs. That's 200 pedestrians killed or injured every day. Locally, (list local statistic here). So it's a problem everywhere. This information is timely and much needed." "Pedestrian safety is a two-way street that requires awareness for both pedestrians and drivers," says Campaign Coordinator (individual's name here). "This campaign addresses both of those audiences," he/she added. Materials include four television PSAs, six radio PSAs, 15 print PSAs, five posters, eight cinema slides, and two brochures. Many of the materials are bilingual. Based upon research conducted for the campaign, producers created PSAs with emotional appeal. Two of the TV spots target drivers with a message to stop for pedestrians. One of those spots involves an adorable five year-old girl who is almost struck by a car while walking with her mother in a crosswalk. (With a stunt driver behind the wheel, none of the actors were in any danger.) Another spot shows a ten year-old girl at an intersection holding a photo of her mother. She tells viewers her mother was killed while trying to cross the street safely and asks who will take care for her now. Two of the TV spots target pedestrians. 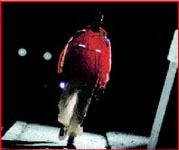 One shows how wearing reflective materials will help drivers see pedestrians in the dark. The other tells viewers to obey pedestrian traffic signals and watch for turning cars. The campaign materials were designed to complement each other and all have a similar look and feel. The TV spots, print PSAs, posters and brochures have a de-saturated palette, with just the central character in vivid color, and the TV and radio spots all use the same music. at (phone number) or (email address). This and other newspaper articles can be found on Data CD2 as Newspaper Articles.doc. Anytown - The latest traffic safety report reveals that last year, 13 Anytown pedestrians were killed and many more were injured in motor vehiclepedestrian crashes. Per capita, those figures are slightly higher than the national average. 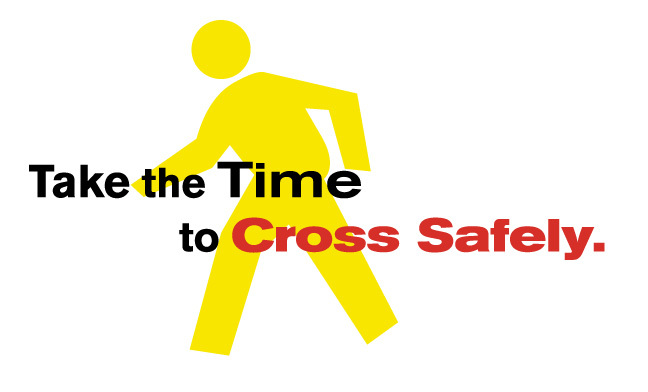 Nationally, it's estimated that 5,000 pedestrians are killed and 85,000 pedestrians are injured each year. During the last decade, more than 63,000 pedestrians died and more than a million others were injured in pedestrian-vehicle crashes. Of the people killed, 60 percent were working adults, 23 percent were seniors aged 65 or older, and 17 percent were children under 21. Clearly, children and seniors are at highest risk. In Anytown, seven children died and at least 37 were injured while walking last year. Meanwhile, four of our seniors were killed and at least 24 injured as a result of vehicle-pedestrian crashes. Experts say many of these crashes are due to unsafe behaviors by both pedestrians and drivers. So to address the problem, government officials, law enforcement, educators, local businesses, and parents have teamed up to raise awareness about pedestrian safety. Over the next six days/ weeks/months, members of the Anytown Pedestrian Safety Coalition will be conducting a public education campaign to raise awareness about ways to make walking safer for everyone. 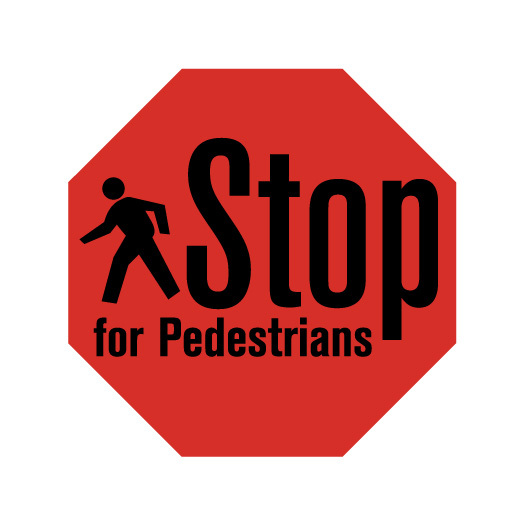 The campaign is targeted to both pedestrians and drivers, and includes information designed to enhance pedestrian safety; such as crosswalks, pedestrian warning signs, pedestrian crossing signals, and reflective materials for nighttime visibility. 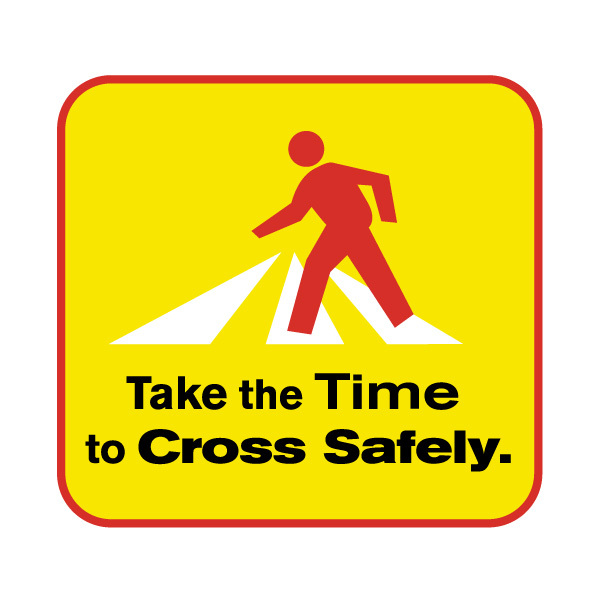 For pedestrians, a series of public service announcements (PSAs) encourage everyone to cross safely: use crosswalks, cross at the corner, or cross at other designated crossing areas; obey pedestrian crossing signals; and wear reflective materials when walking at night. 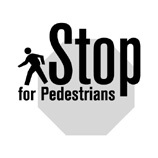 A series of PSAs urges drivers to look for pedestrians and stop for them. 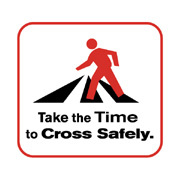 The series highlights a variety of situations, including the need to look for pedestrians in crosswalks and other designated crossings, as well as at all intersections; to remember to look for pedestrians when turning; and to keep in mind that when a car is stopped ahead of you, there may be a pedestrian crossing. Nighttime visibility is one of the most important pedestrian safety issues covered. National statistics show that almost fifty percent of pedestrian fatalities occur between the hours of 6:00 p.m. and midnight. So the campaign includes PSAs and events to encourage schoolchildren and the public to carry a flashlight and wear reflective materials when walking at night. Local police say the overall campaign is much needed. "I've seen so many near misses where a pedestrian crosses the street wherever they like, not looking for turning vehicles," says Officer Jack Delvan. "On the other hand, we've also had a few fatalities and many injuries because drivers are in a hurry, they're turning and they look for cars, but forget to look for pedestrians," Delvan added. The Anytown Pedestrian Safety Coalition is currently conducting a campaign to remind drivers to look for pedestrians; and to encourage pedestrians to use crosswalks and follow the pedestrians crossing signals. Information about these issues and more is available in both English and Spanish. To volunteer or obtain more information about Anytown's Pedestrian Safety Campaign and other associated events, please call (Campaign Coordinator's name here) at (phone number) or (email address). Identifying the target audience(s) is the first step toward designing a successful marketing campaign. 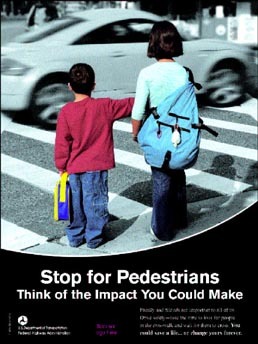 FHWA designed the Pedestrian Safety Campaign based on research. The first step was to convene a Technical Working Group (TWG) composed of engineering, enforcement, health, education and traffic safety experts representing various disciplines from around the United States. During the course of the project, the TWG met three times. At the first meeting, the group addressed their main objectives, which included: sensitizing drivers to pedestrians' rights to the road; educating pedestrians about minimizing their risks; and developing program materials to educate pedestrians and drivers about engineering safety countermeasures. In the first meeting the target audiences were also identified: young drivers and working-age pedestrians. Targeting these audiences would have the largest impact on the pedestrian safety problem. Young drivers cause a disproportionate number of crashes. Pedestrians are a varied group; working age adults are captured in this audience, as are parents of young children and older adults. Over one hundred pedestrian safety-related campaign items were collected from 16 states and national campaigns as research material for the Pedestrian Safety Campaign . These items were each individually reviewed by Communications Specialists and catalogued. These materials were reviewed and analyzed, and some common themes were identified and taken into consideration as new materials were developed for this campaign. Furthermore, some of the materials were shown to focus groups and evaluated by target audience members. Of the 108 items, 13 were videotapes containing television PSAs; 39 were brochures, booklets or leaflets; and eight were posters. In addition, there was a slide presentation, yard signs, newspaper articles, buttons, a newsletter, some Spanish-language materials, a zipper pull, wallet card, and a variety of other materials. The TWG generated multiple ideas for campaign concepts and taglines during the first meeting. In addition, eight focus groups were conducted during the course of the project. Four groups were held with drivers and four with pedestrians. Groups were held with drivers and pedestrians in order to assess their differing perspectives, motivations, concerns, and preferences. The groups yielded a great deal of valuable information and were a guiding force throughout the campaign development process. Numerous taglines, concepts, themes, and creative approaches were tested with the focus groups. Their detailed comments and suggestions shaped the campaign materials. For example, the drivers asserted that children get their attention and that they drive more cautiously around children. The drivers and pedestrians both thought that pedestrian injuries and fatalities are a serious issue that should not be treated lightly - they did not like humorous approaches. All of the pedestrians indicated feeling afraid while walking. They were all fearful of being hit by a car. Furthermore, all of the pedestrians could recall "close calls" with a vehicle, and one even reported being hit by a car. The TWG was re-convened after the first six focus groups had been conducted. The research results were reported to the TWG, as well as the themes, slogans, and materials that FHWA developed as a result of the research participants' input. The creative materials were further refined based on the TWG's feedback and were tested again with focus groups of drivers and pedestrians. Finally, all of the research was compiled: the focus group recommendations, the TWG recommendations, and the quantitative information concerning pedestrian crashes. Then the concepts were further refined and the ones deemed most effective were selected for production. Subsequent to the production of the television and radio PSAs, the TWG met for a final session. The group reacted positively to the four television PSAs and offered valuable insight into refining the radio and print PSAs prior to final production. They also offered their suggestions for the construction of the Pedestrian Safety Campaign Planner. The group strived to attain the same "look and feel" throughout the campaign materials. This newspaper article appeared in the Montgomery County, MD Bethesda Gazette following the TV PSA filming. A silver sedan narrowly missed hitting a woman and a 5-year-old girl as they crossed the street at the corner of St. Elmo and Norfolk avenues in Bethesda on Tuesday. Minutes later, as the woman and girl crossed at the same crosswalk, the same car nearly clipped them again. The same thing happened again 15 minutes later - and then again. But no one was injured, as it was all arranged before cameras as part of a public service campaign to raise awareness about the importance of pedestrian safety. Film crews from Atomic Dog, a production company in Washington, D.C., trucked in cranes, cameras, lights and actors into downtown Bethesda Tuesday to begin shooting the first of four pedestrian safety spots for the Federal Highway Administration. The 30- to 60-second public service announcements, to be broadcast nationwide on television this fall or winter, highlight the responsibilities that drivers and walkers share in guarding against accidents. Janet Coleman, the administration's director of safety programs, said while the number of pedestrian fatalities nationwide dropped by 27 percent in 2000 to 4,739 from the 6,482 reported in 1990, the agency is committed to making more progress. "We'll never be satisfied until we have zero pedestrian fatalities," she said. In the spot filmed Tuesday, actress Rahaleh Nassri of Washington, D.C. looks both ways before crossing Norfolk Avenue, holding the hand of 5-year-old Monica Garza. Halfway across the crosswalk, however, Nassri drops her floral shopping bag and grabs the little girl just in time, who screams as a silver Chrysler Concorde appears to nearly hit them while turning. Actress Rahaleh Nassri of Washington, D.C. pulls back 5-year-old Monica Garza of Charles County Tuesday during filming of a pedestrian safety public service announcement at the intersection of St. Elmo and Norfolk avenues in Bethesda. Stunt actor Sean Kelly of Glen Echo was behind the wheel of the car, and the actors were not in danger. "Mmm, that was a little close," said Joyce Garza of Charles County, watching nervously from the sidewalk as her daughter Monica rehearsed the near-accident. "They had not told me about this until about 15 minutes ago. The only thing we knew was that there would be an intersection scene. Monica's pretty fearless, though. The only thing that concerned her was that she'd have to drop the ball she's holding." Stunt actor Sean Kelly of Glen Echo, who was behind the wheel of the silver Chrysler, said the spot was being choreographed carefully, as neither Garza nor Nassri are stunt actors. "It's incredibly safe, but we're making it look terribly scary," said Kelly, who has appeared in numerous films and TV shows, including "The Wire" on HBO. "Bryan [Elsom, the director] will use camera angles from behind the actors and from the point of view of the driver to create the effect." A few yards off, Montgomery County Police Lt. Harold Allen said the near-miss scene was all-too realistic. "It's a real problem, a very legitimate scenario they've set up," he said. "People get too distracted." This afternoon, the crew is filming the second spot at Norfolk and Cordell avenues, in which a 10-year-old girl stands by a street holding a picture of her mother. The girl tells viewers her mother died in a car collision, and asks who will take of her now. "These are all emotional appeals," said Susan Yates, account manager for LISBOA Inc., the communications firm hired by the Federal Highway Administration to coordinate the $50,000 safety campaign. When completed the campaign will include print and radio materials as well. "We started at first with the idea of using animation or being funny, but the [test] audiences hated it,"Yates said. "They were very direct about wanting emotional impact." The third spot, which features equipment from Bethesda-Chevy Chase Rescue Squad, will be filmed tonight at the intersection of Battery Lane and Keystone Avenue. In it a firefighter speaks about the importance of wearing reflective clothing both on and off the job. The fourth spot will combine footage from the other three. Atomic Dog producer Dana Voorhees said filming downtown required coordinating with a myriad of local entities in addition to the police department, including Bethesda Urban Partnership, the county executive, Bethesda-Chevy Chase Rescue Squad and others. But that "rigmarole" was worth being able to film locally, said Carol Flaisher, an independent production manager hired for the project, and a resident of Cabin John. "As soon as I found out what we were looking for, I told [Elsom], this is the place," she said. "Bethesda's a city, but it's not too urban. It's attractive, but not too recognizable. It could be Any City, USA." Elizabeth Lisboa, owner of LISBOA Inc., agreed. "I've been here for 20 years," she said. "This is such a great neighborhood. It's so great to be able to bring business to Bethesda." Not all local business owners were quite so enthusiastic, however. Young Kim, owner of Temptationz Café at the corner of Norfolk and St. Elmo's, said he hoped the project would attract the interest of passers-by, but worried the crews and traffic restrictions would block access to his restaurant. "I'm a little bit concerned," he said, looking out of his window. "I guess as long as they don't completely block the street, it'll be OK. They said if I lose a lot of business they'll write me a check for it. ... But if they completely block things off, it won't be just me who's affected." Flaisher said keeping local businesses happy during the shoot was a challenge. "What usually happens is that it's fun, a local morale booster - as long as no one gets interrupted," she said. "We want to make sure we can come back here; it's a trust factor." Across Norfolk Avenue, La Miche restaurant co-owner Jason Tepper was happy to rent out his private dining room for use as a costume and prop area. "It's a great cause, pedestrian safety," he said. "I guess we're lucky we're in such close proximity to participate." Road access around the filming sites was restricted at times Tuesday, but fully blocked off only for short intervals while the stunt car was in use. Less restriction is expected for today's shoots. Some parking around the film sites have been reserved with bagged parking meters, at the Federal Highway Administration's expense. Allen was one of several off-duty Montgomery County Police officers hired to control traffic around the sets, and ensure security. As he waved cars past the set on Tuesday, he reflected on the poor judgment displayed by people crossing the street nearby. "Safety is a two-way street," he said. "There'll be a safe crosswalk within 50 yards of people, and they'll cross right in the middle of the street. Just look at that woman down there," he said, nodding in the direction of a woman crossing the middle of St. Elmo's Avenue. "They just don't get it. You've got to start educating people. This is a good start." Public service announcements, demonstration projects, and a university course are key components of a new FHWA push to improve pedestrian safety. 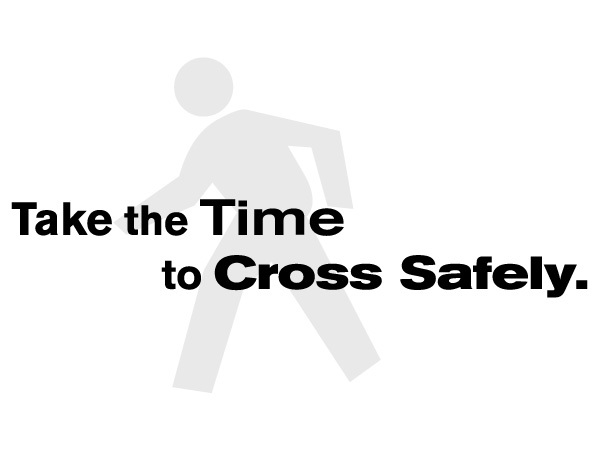 "In the time it takes to stop for someone in the crosswalk, you could save a life - or change yours forever.
" 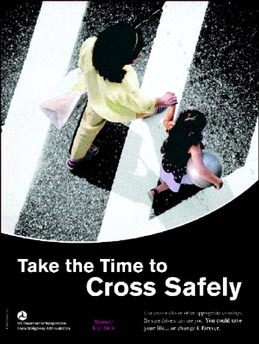 Extracted from a radio public service announcement (PSA), this compelling reminder for motorists to brake for pedestrians in crosswalks lies at the heart of a new Federal Highway Administration (FHWA) drive to generate awareness among drivers and highway designers about the importance of pedestrian safety. On average, a pedestrian is killed or injured in a traffic crash every 7 minutes. In the past, FHWA concentrated most of its safety resources on improving the roadway-driver environment more than the pedestrian environment. However, with pedestrians accounting for approximately 11 percent of roadway fatalities each year, the agency has modified its approach, and more effort and funding have been forthcoming in recent years to safeguard walkers and bicyclists. In fact, reducing pedestrian fatalities and injuries now is one of the FHWA Safety Office's top priorities and is part of the safety-related objective in FHWA's Vital Few goals. More than simply providing highway engineers with the tools and resources they need to improve the roadway environment for foot and bike traffic, FHWA's approach now includes education and outreach, with a three-pronged strategy: (1) educating the public about safe pedestrian behavior, (2) getting drivers into the habit of watching for and yielding to pedestrians, and (3) ensuring that engineers and planners accommodate for nonmotorized traffic when they design roadways and other transportation facilities. Among FHWA's ongoing tactics are an outreach campaign that includes television and radio PSAs, a demonstration program that will test and evaluate pedestrian safety countermeasures, and a new university course on designing pedestrian and bicyclist facilities. Tree-lined streets, shops with outdoor seating, and wide sidewalks are among the features that contribute to mixed-use development. The idea for a pedestrian safety outreach campaign stemmed from a vision of persuading people to think about safety as they go about their daily lives. The threefold purpose of the campaign is to (1) sensitize drivers to the fact that pedestrians are legitimate road users and should always be expected on or near roadways, (2) educate pedestrians about minimizing risks to their safety, and (3) develop program materials to explain or enhance the operation of engineering measures such as crosswalks and walk signals. Working with a limited budget, FHWA elected to develop a ready-made toolkit of outreach materials that States and communities could customize and use locally. The toolkit includes materials designed for use on television and radio and in cinema and print advertising. States and communities take responsibility for contacting local television and radio stations and print media to place the PSAs. FHWA also is developing a strategic planning guide that explains how to implement the campaign successfully at the local level. From past experience, FHWA's pedestrian safety team knew that it would need the buy-in of the potential stakeholders in order for the campaign to move forward. In the early stages, FHWA formed a technical working group consisting of representatives from State departments of transportation (DOTs), the National Highway Traffic Safety Administration (NHTSA), FHWA field and resource center offices, and experts from the health, education, law enforcement, public relations, and transportation disciplines. The technical working group met in Washington, DC, on three occasions during the year that it took to develop the campaign. Adult and child actresses approach a crosswalk in Bethesda, MD, as a film crew records video footage for a new FHWA public service announcement (PSA) educating drivers on pedestrian safety. This aerial shot of a parent and child in a crosswalk in one highlight of a new FHWA television PSA that helps remind drivers to watch for pedestrians in crosswalks when making turns. 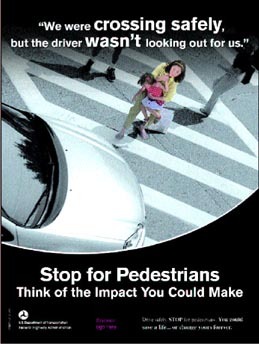 Another FHWA PSA makes a hardhitting appeal to drivers to look out for pedestrians because the lives of children - and, in this case, the dead mother whose photo is held by her daughter - are in their hands. With so many messages bombarding the public in daily life, one of the greatest challenges in developing the outreach campaign was deciding on themes and messages. In addition to capitalizing on the expertise brought to the table at the meetings of the technical working group, the team also hosted eight focus group meetings in Washington, DC; Chevy Chase, MD; and Los Angeles, CA. Focus groups typically contain about 10 participants and are intended to provide insight into the thinking of an average member of the public. Although not statistically significant, focus groups can provide useful attitudinal and behavioral information, specifically regarding factors that influence both driver and pedestrian behavior. The findings from the focus groups indicated that (1) drivers are most influenced by the thought of hurting or killing a child; (2) both drivers and pedestrians want messages that appeal to them emotionally and are jarring, not anything humorous; (3) both drivers and pedestrians want to see and hear an actual crash in any video materials, as well as the aftermath. The television spots focus on the meaning of the pedestrian signals and the importance of pedestrians making themselves visible at night. The driver spots have a strong emotional appeal. In one spot, for example, the camera cuts from the image of a mother and child walking to that of a driver about to make a left turn. As he drives down the road, various thoughts pass through his head: I'm a safe driver . . . I watch for cars . . . I pay attention . . . An image of the pedestrian crossing sign and the pedestrian signal pop into view, as does the image of the traffic signal on green. The driver makes a left turn not noticing the pedestrians in the crosswalk. The driver slams on the breaks and stops inches from the child, who is swooped out of harm's way by her mother. The driver, who appears completely shaken, gets out of the car and lets out a deep breath. The last image is of the child continuing to cross. She turns to look behind her, making eye contact with the TV viewer as if to say, "You could have hurt me." 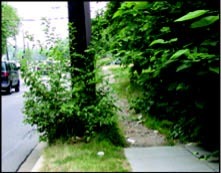 The well-trodden path that continues where the sidewalk ends provides evidence that pedestrians continue to use this route. Designers should look for such clues when considering locations for infrastructure improvements for foot traffic. The other driver-focused spot shows haunting images of a 10-year-old girl standing on a street corner holding a framed photo of her mother who was killed crossing the street. As other pedestrians pass her, she holds the photo up to them as they ignore her. She silently appeals to drivers to look for pedestrians and stop for them. The radio spots were more challenging to make, lacking the visual images that were so effective in the television PSAs. All the radio spots target drivers. Four of the six feature an actual crash, complete with muted sound effects. Five have a heavy emotional appeal, while the last one features a pedestrian offering to compromise with drivers. "I'll watch out for you and cross the street safely," says the pedestrian. "You watch out for me and stop. Think of the impact we can make." After developing, testing, and revising the campaign themes and messages, the team agreed on the framework for the television PSAs and began searching for the ideal intersection to film. Potential locations needed to have well-marked crosswalks, correct pedestrian signals, and good sidewalks and curb cuts. The team looked for an urban or suburban setting in the Washington, DC, area and finally settled on two intersections in Bethesda, MD. Since the crosswalks were not well marked, the Montgomery County government quickly stepped in to provide high-visibility crosswalk markings at both locations. Selecting actors also was a key component. 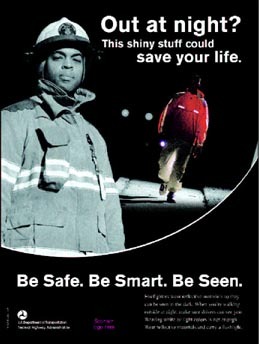 Professional actors played the parts in the drivertargeted PSAs, but one of the pedestrian PSAs - which focuses on the importance of wearing reflective clothing for visibility at night - takes place in a firehouse and features a volunteer firefighter. In addition to the television and radio spots, the team also developed four pedestrian-targeted and four driver-targeted print PSAs and two posters. The campaign materials will be ready in their entirety by early 2003. 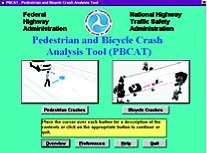 The opening screen in PBCAT prompts users to begin by selecting "Pedestrian crashes" or "Bicycle crashes" for analysis. Researchers at FHWA, in cooperation with NHTSA, developed the Pedestrian and Bicycle Crash Analysis Tool (PBCAT) to assist State and local coordinators, planners, and engineers with analyzing crashes and developing effective countermeasures. By analyzing data from actual crashes, such as where and when they occurred, characteristics of the victims, and the sequence of events leading up to the crashes, the PBCAT software can produce tables and graphs illustrating the relationships among various crash types and other factors associated with the crashes (age, gender, light conditions, etc.). PBCAT also provides recommended countermeasures linked to specific pedestrian and bicycle crash types. Creating a safe pedestrian environment involves more than laying down a sidewalk or installing a signal. 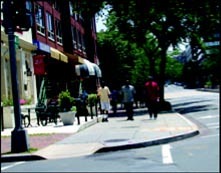 A truly viable system is accessible to all pedestrians and starts with the a built environment that has destinations located close enough to each other for walking access; schools, parks, and public spaces sited appropriately; zoning that permits mixed-use developments; sufficient density to support transit; and commercial districts that people can access by foot. Thus, pedestrian facilities need to be planned, designed, operated, and maintained to be usable by all. Traditionally, analyses of police crash reports provided the impetus for pedestrian safety improvements. Whether building new infrastructure or renovating existing facilities, planners and designers need to accommodate nonmotorized traffic. And methods should be identified to predict potential problems during the planning and design phases before crashes occur. Every day, across the United States, pedestrians face similar challenges trying to get from place to place safely. Safety practitioners at FHWA recognized a need for an educational tool that could reach a broad audience of road users - from engineers and designers to the law enforcement community and educational institutions. In 2001, FHWA created an interactive CD-ROM and online tool called "Safer Journey" to meet this need. "Safer Journey" is an animated virtual journey that follows a 14-year-old as he embarks on a walking trip from his home to a soccer field and back. Along the way, he encounters typical pedestrian situations such as busy streets without sidewalks, mid-block crossings, intersections, bus stops, and shared-use paths. The latter part of the trip takes place after dusk to simulate nighttime issues. Throughout the trip, the user helps the youth make appropriate decisions and has the opportunity to learn more about pedestrian safety features. By the end of 2002, FHWA expects that at least eight States (California, Illinois, Indiana, Maryland, South Carolina, Tennessee, Virginia, and Texas) will have formed partnerships among FHWA and State departments of transportation and education to produce, market, and implement "Safer Journey" in classrooms. To date, "Safer Journey" has won three international awards from Omni Intermedia and the U.S. International Film and Video Festival, as well as commendations from State and local officials. FHWA is translating the "Safer Journey" materials into Spanish, and a version targeting bicyclists also is under development. Check out "Safer Journey" online at http://safety.fhwa.dot.gov/ped_bike/. 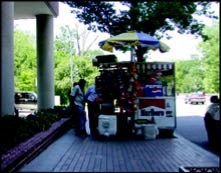 This hot dog vendor has taken up so much of the sidewalk that pedestrians may be forced into the road in order to get around the cart. Past research on pedestrian safety focused on evaluating individual countermeasures, but safety personnel at FHWA and elsewhere recognized a need to examine safety impacts from a systemwide approach. In response, FHWA launched the Pedestrian Safety Engineering and Intelligent Transportation System-Based Countermeasures Program (PSECP) to demonstrate and evaluate that kind of approach. The objectives of the PSECP are to reduce pedestrian crashes and pedestrian-vehicle conflicts and to demonstrate the program's portability to other jurisdictions. FHWA organized the PSECP into three phases - problem identification, implementation, and evaluation. In 2001, FHWA solicited proposals nationwide for jurisdictions to identify local problem areas and indicate interest in participating in the program. Locations with a high number of pedestrian fatalities were prime candidates. FHWA ultimately selected Miami Dade, FL; Clark County, NV; and San Francisco, CA. Pedestrian fatalities accounted for more than 25 percent of traffic fatalities at each jurisdiction. The next step, phase 2, will involve implementing and evaluating selected pedestrian countermeasures at different zones within each site. The PSECP project's unique features include (1) deploying common pedestrian safety countermeasures at each site; (2) using standardized performance measures; (3) employing a zonal process (that is, identifying a subset of locations containing pedestrian problems) for targeting pedestrian safety improvements; (4) analyzing crash types with a software program, Pedestrian and Bicycle Crash Analysis Tool (PBCAT), developed by FHWA and NHTSA; (5) using a geographic information system (GIS) to develop maps showing pedestrian crash densities, (6) applying conflict analysis techniques to predict pedestrian crashes, and (7) engaging an independent evaluator to produce a crosscutting and how-to manual. Lessons learned to date indicate that effective pedestrian programs are based on strong partnerships, public participation, and sensitivity to community concerns. They require accurate data, demonstrate an understanding of demographics, and feature pedestrian-oriented development regulations. Engineering, enforcement, and education are all critical elements in an effective pedestrian safety program. Engineering solutions often involve a combination of treatments at any one site, and any program evaluations should review the individual treatments as well as examine area-wide effects for both safety and mobility. Strong management support also is key to ensuring a successful program. As of the end of 2002, phase 1 activities for Miami Dade and Clark County were completed. San Francisco will complete phase 1 by March 2003. After reviewing civil engineering and planning curricula at universities across the United States, safety professionals at FHWA discovered an absence of information on accommodating pedestrian and bicyclist issues. Many students graduate without having a working knowledge of how to integrate walking and biking facilities into the planning and design of roadways. When informal feedback from professors indicated a lack of time or inclination to generate their own materials, FHWA began developing a university course on pedestrian and bicyclist facility design. Completed in 2002, the course material is intended for use in undergraduate- or graduate-level transportation planning and design curricula at universities and related institutions. The course provides current information on pedestrian and bicycle planning and design techniques, as well as practical lessons on how to increase bicycling and walking through land-use practices and engineering design. Developed in coordination with professors, the course is designed to be modular so that faculty members can teach it as a complete full-semester course, in segments, or as topics extracted to incorporate into their own courses. FHWA also received input from industry, State and local jurisdictions, the American Association of State Highway and Transportation Officials, the Human Powered Transportation Committee of the American Society of Civil Engineers, and other transportation organizations. An interdisciplinary team approach to planning and implementing bicycle and pedestrian programs helped create materials that can be used to train future transportation professionals representing a variety of disciplines, including planners, engineers, and landscape architects. One component of the course, the Student's Guide, has 24 modules arranged into three sections. The introductory section covers the history of nonmotorized transportation, current levels of bicycling and walking, and factors that influence the choice to bicycle or walk. The planning section provides lessons covering a range of planning issues, including crash types, local bicycle or pedestrian plans, travel in suburban communities, traditional neighborhood design, and local zoning and subdivision regulations. The design modules cover a range of issues in nonmotorized transportation design such as traffic calming, pedestrian accommodation at intersections, on-road bicycle facilities, and trail design. The Instructor's Guide parallels the Student's Guide, providing goals and objectives for each lesson, activities and homework problems, and overheads for the instructor to use while teaching the course. The final components are scripted, 1-hour slideshows providing an overview of pedestrian and bicycle planning and design. To date, more than 90 professors have participated in workshops designed to introduce the course and materials. Gene Russell, professor emeritus of civil engineering at Kansas State University (KSU), attended an early workshop in 1999. "I could see right away that the materials would be excellent for a course," he says. "Whether you're teaching graduate engineering students or offering an elective course for professional development, the materials are flexible so you can use what you want and add your own supplemental materials." Russell, who teaches a graduate version of the course, emphasizes the importance of teaching pedestrian facility design to new generations of engineers and designers. "Increasingly, communities and pedestrian advocates are putting pressure on engineers and policymakers to create more and safer environments for nonmotorized traffic, and we need to build them right," he says. FHWA plans to continue promoting the university course nationwide. The course materials are available on the Web at http://safety.fhwa.dot.gov/ped_bike/univcourse. The Association of Pedestrian and Bicycle Professionals also has put together a task force to help promote the course. Achieving FHWA's goal of reducing pedestrian fatalities and injuries requires a comprehensive program that touches on all aspects of the pedestrian safety problem. By employing innovative approaches to reaching out to roadway users and designers, FHWA can have the greatest impact. We will not be satisfied until there are no pedestrian fatalities and injuries. Tamara Redmon is a transportation specialist in FHWA's Safety Office. She has worked for FHWA for 11 years and currently manages the pedestrian and bicyclist safety program. She has a B.A. in English from Virginia Polytechnic Institute and State University and an M.A. in human resource management from Marymount University. Leverson Boodlal has more than 20 years experience in highway and transportation safety projects. He is a consultant to FHWA, currently serving as technical manager and developer on projects involving pedestrian and highway safety. He has a B.S. degree in civil engineering, an M.S. in transportation and traffic planning, an executive MBA, and he is a registered professional engineer. 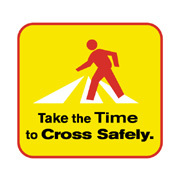 For more information on pedestrian/bicyclist issues, please visit http://safety.fhwa.dot.gov/ programs/ped_bike.htm.